Called Scoby, the material is a membrane made of bacteria and yeast, which is created through a fermentation process. The Polish designer, who created the packaging as part of her graduate project at the School of Form in Poznań, Poland, claims the material can prolong the durability of a food product and then be sustainably disposed of. "Packaging production will no longer litter the environment but enrich it," Janusz told Dezeen. The membrane is grown in shallow containers by feeding agricultural waste to bacteria and yeast over a period of two weeks. The material is fermented in a room with a temperature of between 25 to 25 degrees celsius, before being placed in moulds. It does not need sunlight to grow. 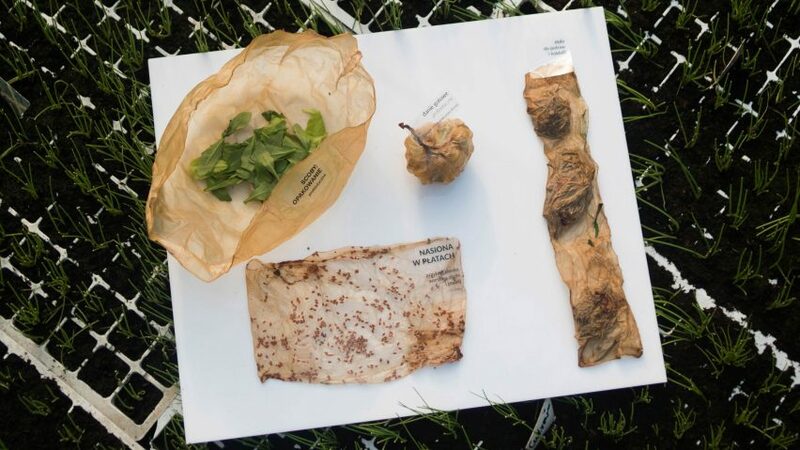 "The material is compostable and nutritious to our gut or the soil because of its healthy bacteria," she said. "It is a product of fermentation and has a low pH, which prevents food from wasting." Janusz believes that creating the bio-composite material can be easily integrated into the farming process at an industrial level. "The farmer is more and more an engineer and the farm becomes a factory," said Janusz. "Growing materials has become more and more popular in design, so maybe growing things is closer and easier than we think," said Janusz. Many designers are turning to unusual materials as alternatives to common plastics, including fallen leaves, algae, flax and even crab shells. Large brands have also begun to respond to the need for sustainable packaging, from Nike recently launching a shoebox made from reclaimed plastic to material development company Ecovative developing a cases made from mycelium.